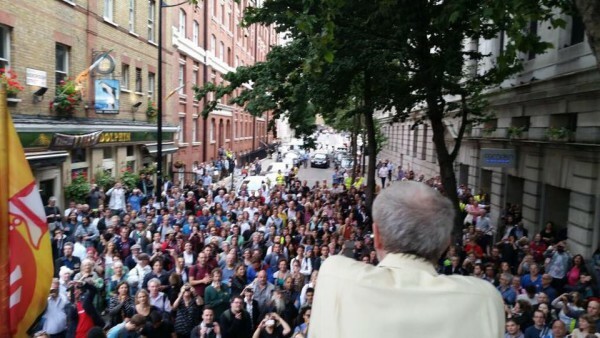 On Saturday Jeremy Corbyn – anti-austerity, anti-war, anti-racist – won the Labour Party leadership by a landslide. The same day, up to 50,000 marched in London, with thousands more in towns and cities across Britain, to say ‘Refugees are welcome here’. Corbyn’s brilliant 59.5% vote comes after a campaign that sprang up from the grassroots, with a surge of enthusiasm bringing thousands of people to his 100 campaign rallies. Many saw the audience spilling out of the assembly halls into huge overflow meetings in the street. To the horror of the entire political and media establishment, Corbyn is now Labour leader. But the campaign itself has transformed the political climate. After the hideous election results in May, bringing us a Tory government and a huge rise in the UKIP vote, we had to endure the miserable consensus of austerity politicians and pundits claiming that Labour had lost because it wasn’t rightwing enough. Suddenly, a very different set of ideas is the subject of public debate – boosting public services, defending welfare, renationalisation, support for refugees, opposition to war. And it has been a joy to see the shockwaves hit the smug Blairites and their media chorus. Vote against Corbyn, “even if you hate me”, begged Tony Blair himself, entirely failing to grasp the level of loathing and derision in which he is held. But now a quarter of a million voters in the Labour leadership elections have stuck up two fingers and spectacularly dumped the received wisdom of decades in the bin. As the Corbyn campaign reached its peak, a wave of public sympathy and solidarity with refugees swept the country too. It produced not only Saturday’s big demonstrations, but also a movement of practical solidarity – with collections of food, supplies and money for the refugees trapped at Calais. Across Europe, in response to the horrifying pictures of little Aylan Kurdi lying dead on the beach and the inspiring defiance of the Syrian refugees who staged a mass march from Hungary to the Austrian border, huge numbers of ordinary people have mobilised to support the refugees. Saturday saw big solidarity demonstrations in Vienna, Copenhagen and many other European cities too. Here, that strength of feeling has very publicly embarrassed David Cameron, and has forced even the most rabid tabloids to produce sympathetic front pages, as if the previous daily fare – hate-filled horror stories of “invading” migrants “storming the Eurotunnel” – had somehow never been. It is a happy day for anti-racists and anyone on the left, whether inside or among those of us outside the Labour Party. But Jeremy Corbyn is not the only person filling the assembly halls. 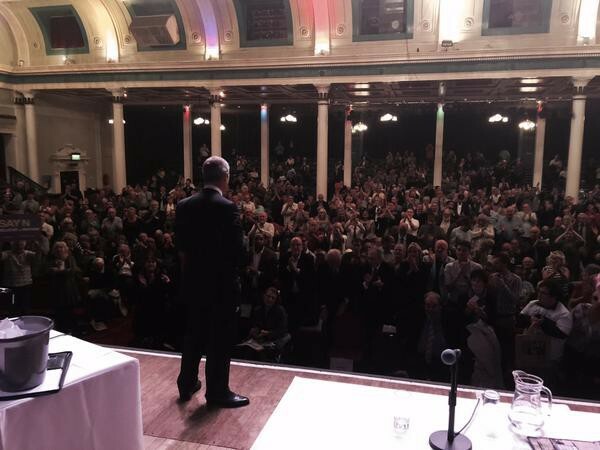 This week 1,500 people turned out in Margate, Kent, to hear Nigel Farage, leader of the racist populist UKIP. That was the first stop on Farage’s Say No to the EU tour, in the run-up to Britain’s in-out referendum on EU membership, which is expected to take place next year. UKIP leader Nigel Farage in Margate this week. Farage and UKIP will peg their campaign – with events already scheduled up to November – on anti-immigrant racism. While anti-racism campaigners will be building on the support and solidarity for refugees, UKIP will be using the same refugees as scapegoats – and the party will get a hearing. The Corbyn surge and the Refugees Welcome campaign are very positive developments, but that springtime feeling should not stop us looking at the nastier side of the political equation. The grim results of the general election still stand – along with the dangerous gains by UKIP that we analysed here. Taking Tories and UKIP together the total rightwing vote was huge. The Corbyn campaign has taken place within and around the Labour Party. But there are plenty of Tory and UKIP voters out there too. Britain has not suddenly turned into “a leftwing place”. What the Corbyn phenomenon has done is to reveal more clearly a level of polarisation in British politics. That polarisation has been apparent across Europe: discontent and anger at austerity and economic crisis has led to a shift away from the centre parties – especially those in government. That movement has gone to far right and fascist parties as well as to the left. In countries such as France, Hungary and Denmark, fascist and far right parties have been the main beneficiaries. In Greece, the Spanish state and elsewhere, the main shift has been towards the radical left. In Britain the polarising situation has been partially masked. At the general election in May, we could see a dramatic shift to the left in Scotland, where the Scottish National Party won a landslide on a leftwing platform challenging the Westminster austerity consensus. But south of the border, where there was no such leftwing outlet, nearly 4 million people voted for racist far right UKIP. Now the existence of a big leftwing, anti-austerity constituency has been brought into the open for all to see. And the refugees campaign has shown how a popular sentiment of solidarity can be mobilised despite the immigrant-bashing of politicians and the press. But it is important to keep both ends of the polarisation in mind. This autumn, UKIP will stage its rallies and try to extend and deepen its base – and it will find an echo. Amid the wave of solidarity, it is easy enough to find people condemning the refugees. And there remains a worrying trend of dividing people into good “refugees” on the one hand and that “swarm” of terrible “migrants” who are coming to take our jobs, benefits and homes on the other. It is important for anti-racists to stand up against the scapegoating of any immigrants, whether desperate refugees or people moving to seek a better life. The contradictory – and sometimes volatile – public mood on immigration can be seen elsewhere in Europe too. In France last week an opinion poll showed that for the first time a majority – 53% – would welcome refugees and migrants, up from 44% a few days previously. The same week, a separate poll showed that fascist Front National leader Marine Le Pen – whose campaign centres on racism aimed in particular at immigrants and Muslims – remains in first place in the race for the French presidency in 2017. That apparent contradiction expresses the polarisation in society. You can feel solidarity for those escaping war and poverty, or be sucked in by the argument that your own poverty and misery is caused not by the bosses and austerity economics, but by immigrants. The polarisation of politics is not equal and balanced, however. It can shift one way or the other – this week we can see the effects of a pull to the left. We have also seen how bold statements of principle and clear arguments can cut through the austerity consensus and the racism in society on which UKIP seeks to build. An interesting opinion poll from Survation during the Labour leadership contest found that Corbyn was more popular with voters of all parties than the three more rightwing Labour leadership candidates – and particularly so among UKIP voters. That should not be as surprising as it might seem. It was longstanding socialist campaigner Corbyn whose campaign expressed a challenge to austerity, to the Westminster consensus and the remoteness of traditional politicians. Without any concession to racism, those ideas attract a section of poorer, working class UKIP voters – although probably not the party’s more affluent middle class supporters. The question of which way anger at poverty and austerity goes – to the left or to the racist right – is a live one, all across Europe. This week’s glimpse of spring shows the potential to counteract UKIP and its vicious racism and pull the public mood to the left. The door is open.